Giant hogweed reaches heights of 15 feet and has highly toxic sap. Submitted photo. Recently, giant hogweed (Heracleum mantegazzianum) has been in national headlines after it was confirmed for the first time in Virginia. Although listed in Minnesota as a Prohibited Noxious Weed, giant hogweed has not been confirmed in Minnesota. In 2011, the Minnesota Department of Agriculture (MDA) and the Minnesota Noxious Weed Advisory committee recommended to the commissioner of agriculture to preemptively list giant hogweed as a means of raising awareness and to make sure it would be reported if found. Originally brought to North America as an ornamental plant, it escaped cultivation and can be found in isolated pockets in many states, including parts of Wisconsin. Giant hogweed is a stunningly tall plant with a serious public health risk. When the sap comes in contact with skin and is exposed to sunlight, it can cause painful blisters and scarring. Additionally, the sap in contact with eyes can result in blindness. It has deeply cut leaves up to five feet across, and the plant flowers on a 10-15 foot stalk. The plant produces large clusters of tiny white flowers that reach up to two and a half feet across. The stalks are two inches in diameter and hollow with purple mottling. Both the stems and undersides of the leaves are covered in coarse white hairs. Giant hogweed can be mistaken for Cow Parsnip (Heracleum maximum), a native plant that is common throughout much of Minnesota. Cow parsnip has similar leaves and flowers, and reaches 3-10 feet tall with 4-8 inch flowers. However, giant hogweed has much larger, strongly dissected leaves and huge flowers. The impacts of giant hogweed are numerous. Not only is giant hogweed a serious public health hazard, it can also negatively impact soil dynamics, fisheries, and outcompete native plants. In states where it has been confirmed, it can be found growing in yards, ditches, along stream banks, in disturbed areas, open wooded areas, and thrives in sunny locations. Giant hogweed spreads by seed that can be moved by wind, water, wildlife, and humans. 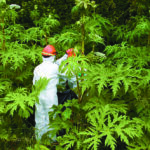 Even though this plant has not yet been discovered in Minnesota, the Minnesota Department of Agriculture regulates giant hogweed as a prohibited noxious weed on the eradicate list. It is also a Federal Noxious Weed regulated by the U.S. Department of Agriculture. By law, all above and below ground plant parts must be destroyed, and no transportation, propagation, or sale of the plants is allowed. If you suspect you have seen giant hogweed, please contact the MDA’s Arrest the Pest at arrest.the.pest@state.mn.us.